It all depends what you mean by the word “generic.” Allow me to explain. The ads are everywhere. They read “priced like a generic, because it IS a generic.” If you haven’t seen the ads, just check out Abbvie’s own website and see for yourself. But every pharmacist working in a retail pharmacy setting KNOWS that the AbbVie brand of Vicodin, which now comes in 3 strengths (5/300, 7.5/300 and 10/300) is priced VERY high for a simple combination of hydrocodone and acetaminophen. Acquisition price is easily 10 times the cost of similar traditional generics. It is much more expensive than the formerly available generics of their previous brand versions. It is much more expensive than the currently available generics of the virtually unused brands such as Norco or Lortab. So what gives? How can they keep telling the public (and more importantly healthcare professionals and prescribers) that their product is now a GENERIC?? The answer is simple. It IS a generic. That is to say, they have negotiated generic “status” with certain major health plans so that consumers who obtain the product receive it for what is generally considered a “tier 1” or “generic” copay. For example, you can check out the formulary tool available online for a major national PBM: Aetna Formulary Tool. Pick any of their plans and then look up “Vicodin.” There you have it: tier 1 (i.e. generic). Or you could look at this list for CIGNA. Once again, Vicodin is tier 1. But wait? If it costs SO much more, and the patient only has to pay $5.00 (for example) why do major health plans allow it to be placed on tier 1 of their formularies? Isn’t this financial suicide? Do they get stuck paying the pharmacy $40-$50 or more for what could have been dispensed for about $20 total? Well, yes they do. BUT that is where the rebate business kicks in. Health plans agree to place a product like Vicodin on tier 1 because they receive a rebate from the manufacturer, which in turn is used to reimburse the pharmacy. So the patient gets it cheap, the pharmacy get’s reimbursed with a small but acceptable profit margin, the health plan doesn’t really spend any more (thanks to the rebate) and AbbVie still gets to sell their product in a market that is virtually dominated by generics. Personally, I’ve got to hand it to them. 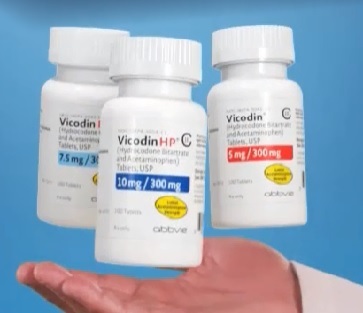 They found a way to take the marketing power of a well known name (Vicodin) and generate sales in a category that essentially belongs to the generic companies. Pretty sneaky. Or pretty brilliant. However you wish to interpret it – they made it work. However, one significant problem is that Vicodin is NOT considered a generic on ALL health plans. Some place it in much higher tiers, and some will not cover it at all. But I suppose it would be far less compelling to change the advertising to say that AbbVie’s Vicodin IS a generic…SOMETIMES or USUALLY. Nah. That’s too wordy. And we would hate to confuse the issue with the facts. 2 Responses to Is AbbVie’s Vicodin REALLY a Generic?? Jason: This may be an ingenious way for the company to get their medication filled more often; however, it certainly does not make things easier for the pharmacy. In our practice, we find that once a physician has a specific formulation of hydrocodone/apap on their brain, that is the one they will most likely prescribe the second time. If a dentist calls in or writes 5/300 and it goes through insurance for some patients and not others, they will quickly change their tune and write 5/325 from then on. Having a physician write 5/300 instead of 5/325 for cash paying customers…well….that is just not fair and rather expensive. Furthermore, the increased burden of cost put on the pharmacy to purchase and stock the 5/300 when 5/325 is EXACTLY THE SAME is ludicrous. I am sure you can guess how we handle just about every 5/300 prescription that walks through the door. Well said Steve. We’ve never filled a cash script for it. It is crazy expensive and I want ALL prescribers to know exactly that is going on. The pen is mightier than the sword. And the truth…though it hurts…will triumph in the end. Frankly, I tell all docs just to write Norco 5/325. That is fast and easy. Patients will get an affordable generic…cash or insurance. » Prescription Drugs » Is AbbVie’s Vicodin REALLY a Generic?? Confused by Divalproex DR vs. Divalproex ER? Opioid Nonabusers – An Inconvenient Truth?